Up close with the Bloodstone or Heliotrope | Is This Mutton? When I started researching this post on the alternative birthstone for March, I wasn't very excited. The bloodstone (also known as heliotrope) seemed initially to be more about healing than jewellery. 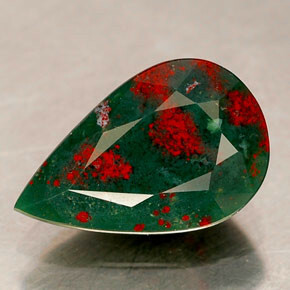 The few examples of bloodstone jewellery I saw were, frankly, hideous. But then I widened my search to "heliotrope" and found a pretty stone that sadly seems to have been forgotten. The bloodstone is renowned as a powerhouse for restoring and rebuilding the mind and body. All stones have healing effects, but some are more powerful than others. Bloodstone is said to have properties which help to return your spirit to its natural state of joy and vitality. With an aesthetic as dark and earthy as the legends surrounding it, the healing crystal garnered a reputation of sacred power in the Middle Ages when the bloodstone meaning was linked to the crucifixion of Christ. The legend holds the belief that the blood from Christ's wounds dripped on the dark green earth, which turned it to stone. This ancient legend gave bloodstone its name and also inspired the long held belief in its exceptional wound healing powers. The stone is also known as heliotrope. Gardeners among you will know that heliotrope is also a pretty, highly fragranced purple plant. Bloodstone or heliotrope is a variety of jasper or chalcedony. The "classic" bloodstone is green jasper (chalcedony) with red inclusions of hematite (said to be the drops of Christ's blood). When you Google heliotrope jewellery, you get some confusing results. 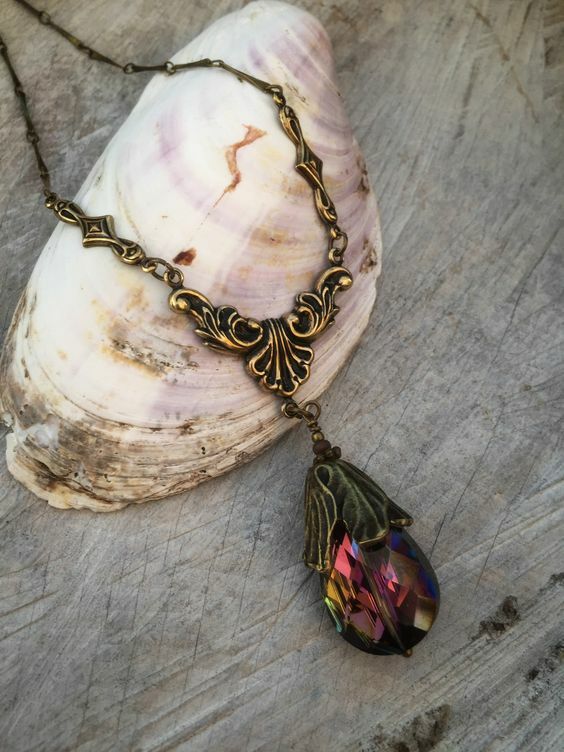 Some show the classic bloodstone, like the necklace example below from Etsy. 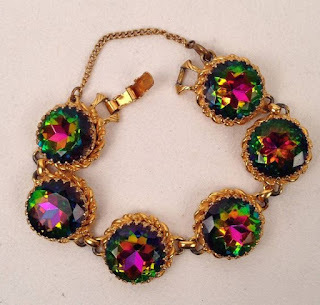 Other image results show you examples of jewellery which is a purple shade - the colour heliotrope, which I suspect is coloured crystal and bears no relation to the actual bloodstone at all. Above: sold for $1080, 1950s Schiaparelli Heliotrope Watermelon Tourmaline ensemble, consisting of a necklace, bracelet and clip on earrings. 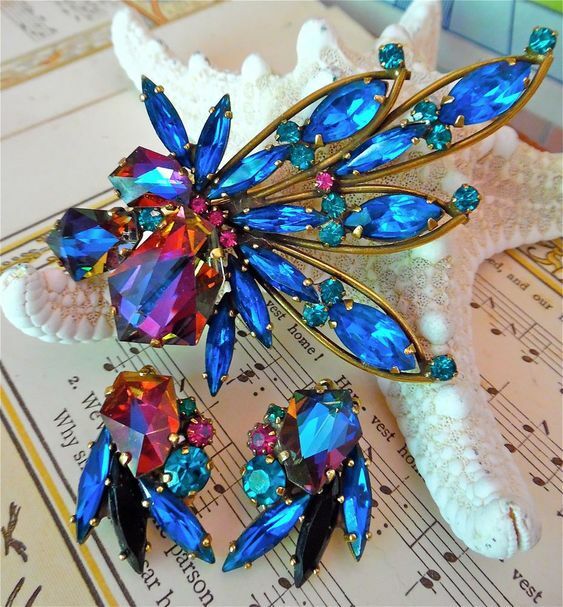 Above: vintage Weiss fantasy watermelon brooch and earring set. Weiss was a 1940s jewellery company founded in New York by Albert Weiss and discontinued in the early 70s. Their costume jewellery is much sought after on vintage sites and ebay. If you were expecting a post about the Aquamarine, which is the best known birthstone for March, fear not, I have you covered. Here's the Is This Mutton guide to aquamarines. Sharing this post with Wordless Wednesdays at Claire Justine, Fake It Until You Make It at Fake Fabulous, #BloggerClubUK at My Random Musings, #SaturdayShare at Not Dressed as Lamb and Sunday Showcase at Elegance and Mommyhood. Wow what a gem of a post..love this..thanks for all the research. Gosh I do like that stone, especially the one in the last Weiss pic! This set of posts is so interesting. I wish I'd kept all my gran's brooches - she had many like this! I had never heard of Weiss but I've started a new Pinterest board on them. Oh wow! Those colours!! Hugs, x.
Wow, these are beautiful stone Gail :) Love the colours. Thanks for sharing at The Wednesday Blog Hop. You know, at first I thought this stone was kind of tacky looking but as I read more about it in your article, it grew on me. It is really lovely and unique. Do all months have an alternate birthstone? My mom and BFF and granddaughter are all March babies. I can really imagine my feisty granddaughter Lucia wearing this showy stone! Most months have an alternative but occasionally the stone is better known as a healing crystal and not used in jewellery. For April it's the diamond or sapphire and I've written about them before. But I'll have alternatives for Mau and June. Interesting, I've never heard that topaz brings bad luck. It's my birthstone too. I prefer the orange Imperial Topaz variety to the blue. They have such beautiful colours! I have a beautiful rosequarts stone. It feels very nice. Oh dear, I am afraid that I am disagreeing with all the other comments this time. I think the bloodstone is hideous. But, as ever, a really well researched piece so thank you for that. It's a stone that's definitely out of favour Catherine so a lot of people probably think the same as you! It's amazing what you can find out about gems and jewelry!! Thanks for all of this info! !